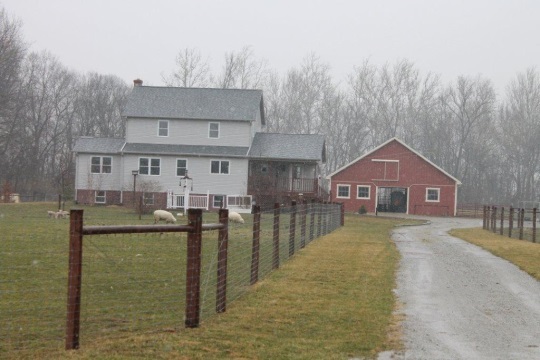 One of our contributors recently paid a visit to the Wayne County settlement. 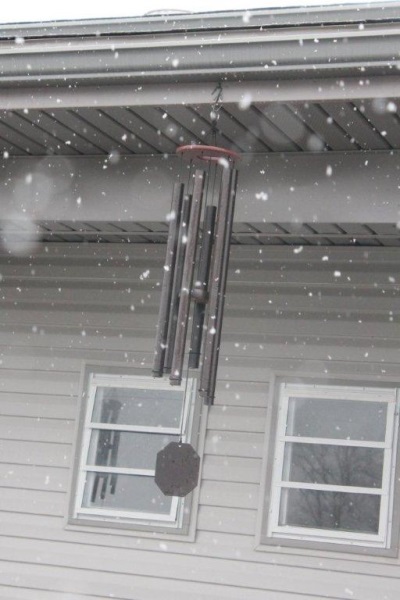 The weather did not quite cooperate that day. 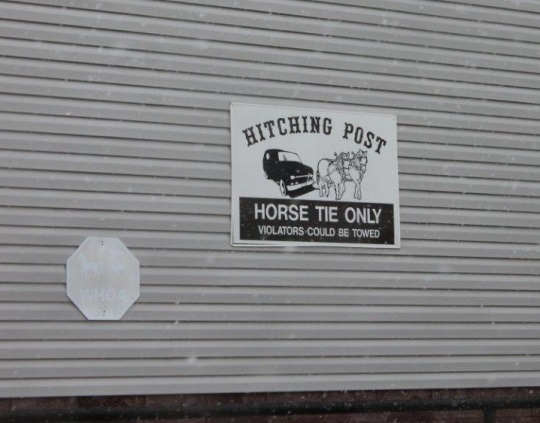 However that gave him a great excuse to duck into one of the more prominent Wayne County Amish businesses. 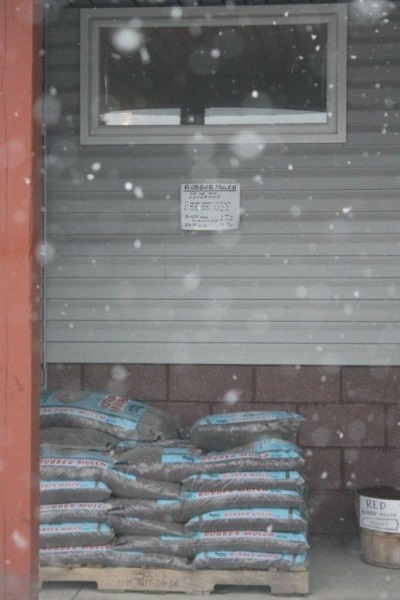 Rubber mulch outside the store. 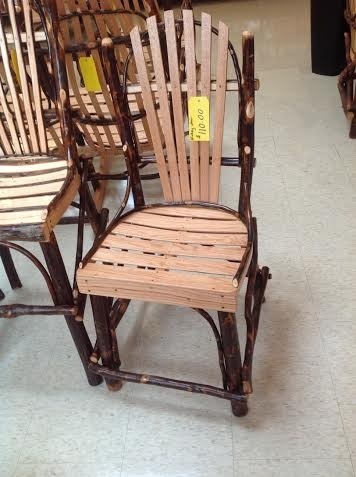 You more often see hickory chairs in the popular rocker models. Those have a correspondingly higher price tag than this small (child-sized?) non-rocking version (yours for $110). Pancake mix, syrup, and more. 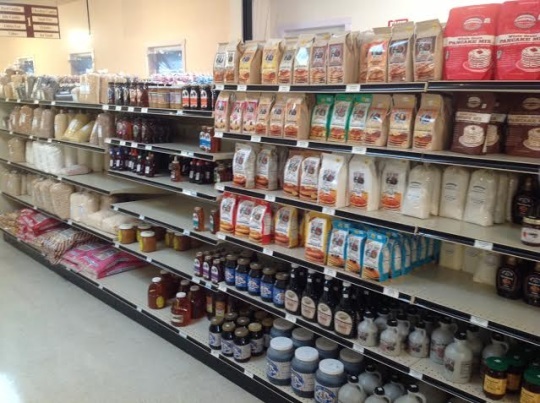 Many Amish folks appreciate home remedies, hence the variety of health-related products touted below. A nice-sized tub of the famous B & W Ointment. 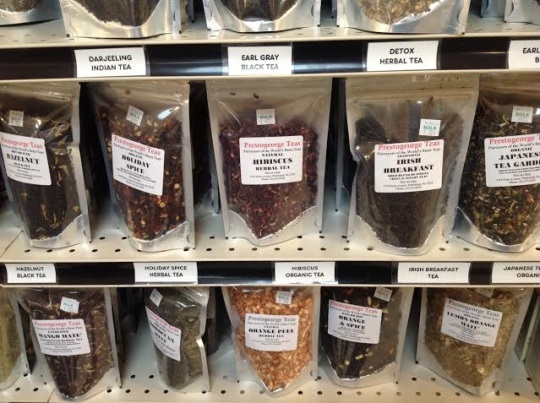 A selection of teas, including Detox Herbal, Hibiscus Organic, and Holiday Spice. 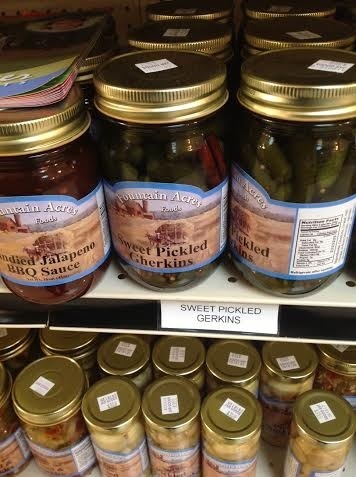 Some of the Fountain Acres-branded canned products. 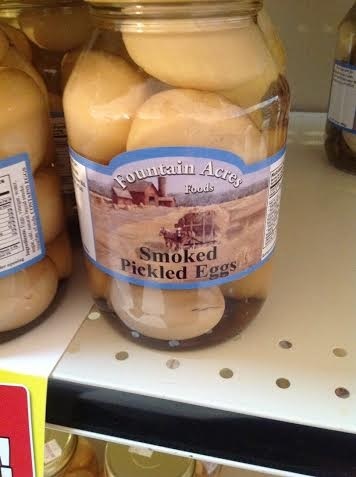 Not just pickled eggs, smoked pickled eggs. I’m trying to decide without ever having tasted regular pickled eggs if these could be any good. I guess I’ll just have to try for myself (someday…). 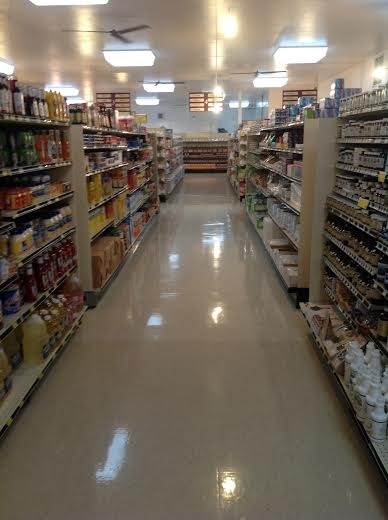 Fountain Acres also sells ready-made foods. 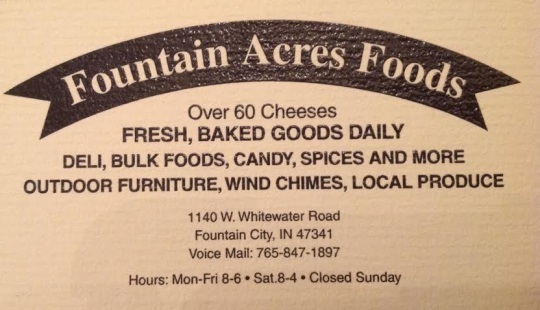 Fountain Acres’ card with info. 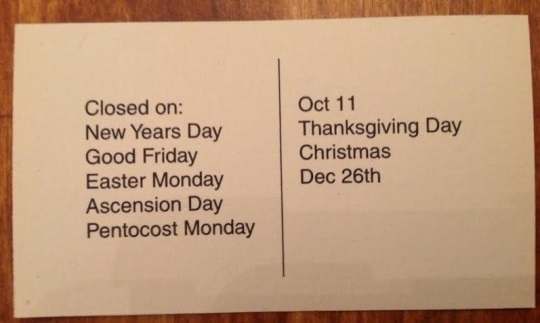 Back of card, telling you when not to come. 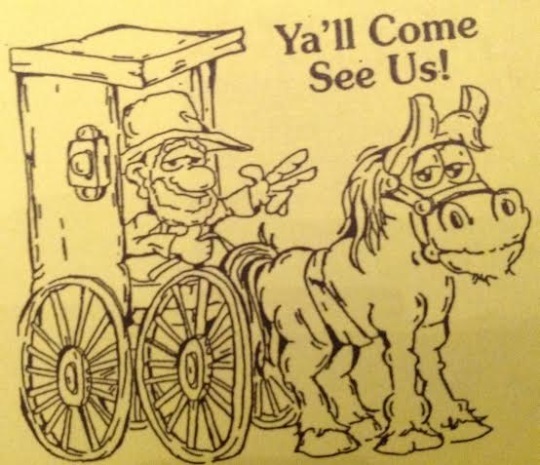 “Ya’ll Come See Us!” “Ya’ll”? 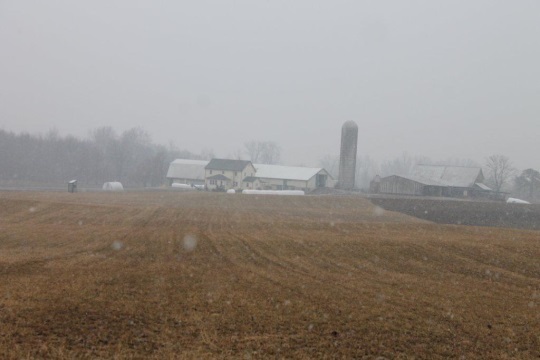 Is this the Midwest or the South? Who’s ya’ll-ing in that part of Indiana? 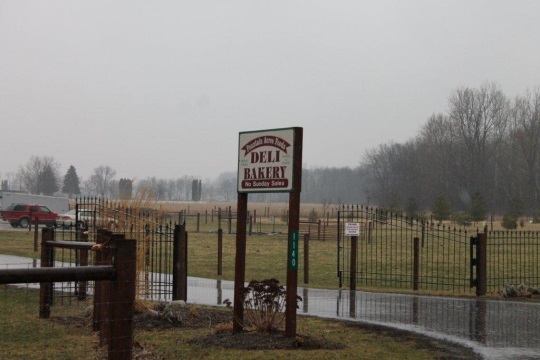 The year 1994 saw the arrival of Amish to Wayne County, Indiana, a border county about an hour east of Indianapolis. The settlers came from Lancaster County, bringing their Lancaster Amish culture, including distinctive buggies and dress, with them. 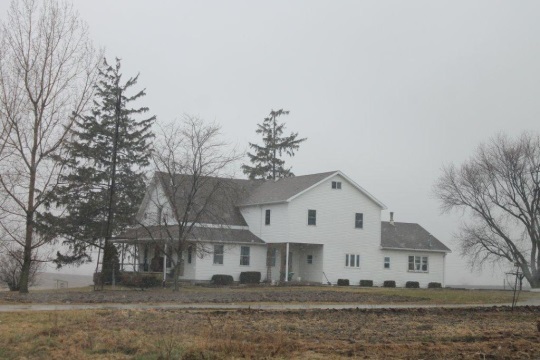 The Wayne County settlement has since grown to 8 church districts in size, making it the sixth-largest of Indiana’s 20-plus communities. 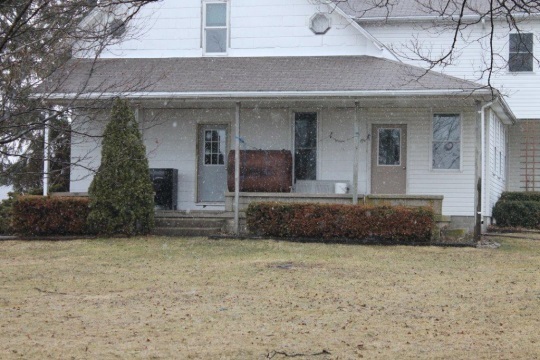 The Wayne County group was actually preceded by other migrants from Lancaster County, who settled on the opposite side of the state in Parke County in 1991. According to “Amish Settlements across America: 2013“, the settlement actually reaches into three counties (Henry and Randolph in addition to Wayne), with Hagerstown and Greens Fork listed as key towns. 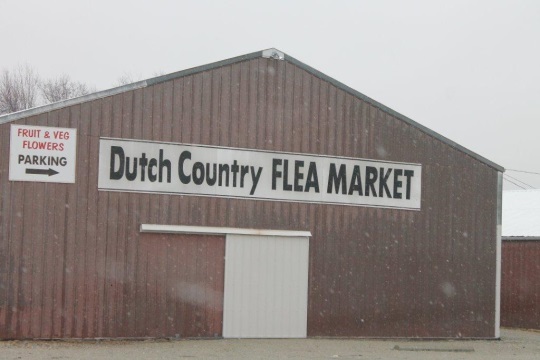 The Dutch Country Flea Market at Greens Fork. This sign is only vaguely threatening towards rogue parkers (“could”, not “will” be towed) but I think does the trick. Note there are actually two buggy-related signs in this shot, one just a bit more faded. Not the ideal vehicle for a mucky day. 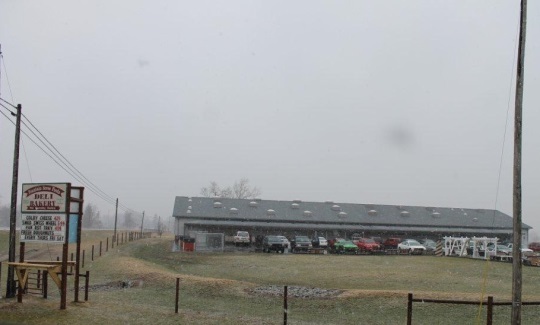 Special thanks to our contributor for this look at a rainy Wayne County Amish community and the Fountain Acres Foods store. Update for y’all: Alice Mary in the comments points out the regular use of “y’all” in far northwest suburban Chicago. Below, the “Y’all Map”, from a fascinating regional dialect project by Joshua Katz of NCSU. Katz plotted which form of many common words/phrases is most often used in a given area based on data from a Harvard study. To Alice Mary’s point, what you see on this map may not be the only form of a phrase used in a given place–the darker the color, the more dominant the word or phrase is in that area. Thanks for sharing the pictures. I enjoyed looking at them. The store looks a lot like our “Beachy’s” in Arthur, IL. Which reminds me, I am way over due for a trip down there, LOL. 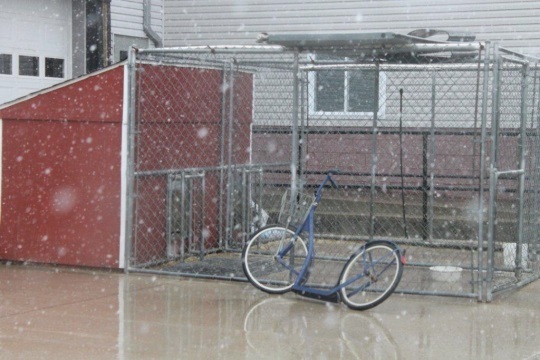 Rainy or not, great pictures! Thanks again! Alice, I had the same thought — it reminded me of Beachy’s which I love to visit. Linda, are you here in Illinois? I am in Clinton, IL. Aber an hour and a half north and slightly west of Arthur. I am hoping to get down there more this year. I want to go to the produce auctions this year too. I was hoping to get down there more last year but it seemed like something was always getting in the way. Really enjoyed see all these pictures. They all looked really good. Thanks, Erik! Loved seeing the pictures! Thanks for sharing. 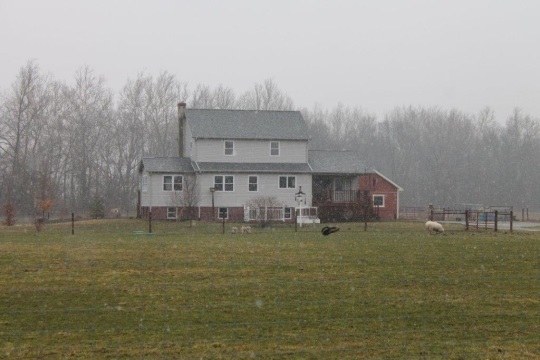 As a photographer I understand the frustration of weather that isn’t cooperating, but for my own personal tastes I really do like the foggy/misty affect that the weather had on the farmhouse shots. Once again Erik I really enjoyed your photos ! It states that Wayne Co. is made up of 8 church districts, aprox. how many people comprise a district ? And how do they decide to form a new one ? Or abandon an old one ? Who makes these decisions ? Thanks guys, always enjoy all your in-put ! As for church districts, it can be tricky to compare b/c some communities have a larger or smaller average church district size. Generally they are 20-40 families. In most cases one getting around 40 families is probably going to be preparing to divide. with one or two churches getting ready to divide. My statement above of Wayne County being 6th largest in Indiana is based on number of churches. Also, when a new community starts, it will be listed as 1 church district, but may only have a handful of families comprising that district, even as little as 2 or 3 depending on the situation. The decision to form a new district is mainly based on how much the church has grown. With home worship people’s homes can only accommodate so many bodies. For whatever reason, some communities wait longer than others. Allen County Indiana had a number of churches over 40-50 families a few years ago and may still do. As far as districts disappearing within a shrinking settlement, a good question. I haven’t looked at that dynamic as much, but at some point when enough families from a church leave, or in particular if a bishop/church leadership leaves a settlement, I believe the remaining families would just attach themselves to one of the remaining districts. I’m not sure how that is formalized in terms of who would go where but probably what makes sense geographically. The article I linked above touches on shrinking/going extinct settlements. I’d LOVE to shop there! 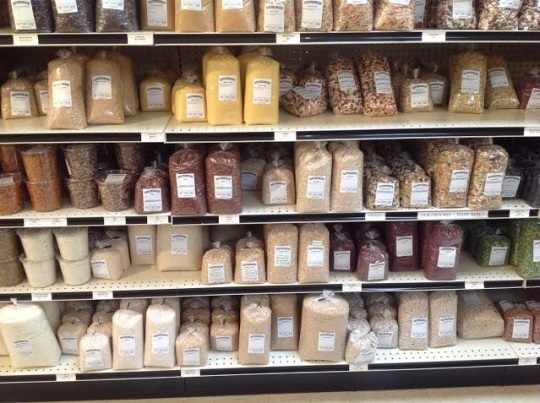 Just the teas and soup mixes alone would practically fill my cart! 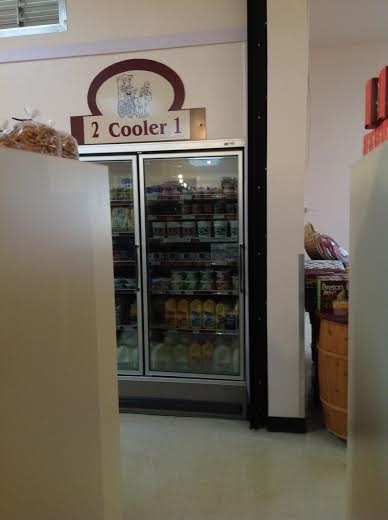 I sure wish there were Amish-run stores around here (I don’t travel very far or very much—still workin’ full time). 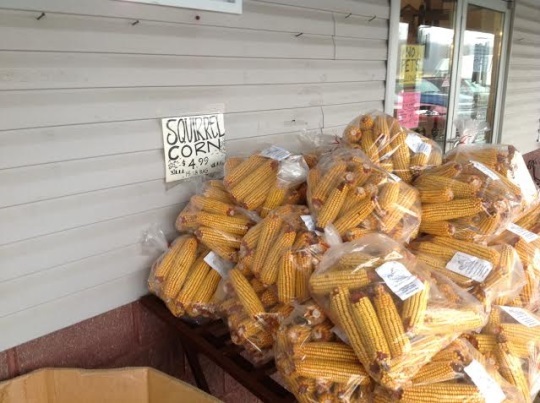 “My” squirrels would appreciate the corn…and I’m in the market for a couple more kitchen chairs to accommodate the grandkids. I sure did enjoy this virtual trip, and thanks to the contributor! Interesting Alice Mary…above I attached the “y’all map”, which is based on a fascinating language project by NC State student Joshua Katz looking at language variation across America (based on data gathered in the Harvard Dialect Survey by Bert Vaux and Scott Golder). He mapped out which forms of common words and phrases are most common in a given location (“soda” vs. “pop” vs. “coke” is another example). Looks like the y’all/you guys dividing line runs through WV/KY/southern MO. Interestingly, the only place “you all” rises to the top is Kentucky (as described to me by a resident, KY is really a combination of 3 or 4 American regions). Love the “ya’ll map” — being from the South (LA — that’s “Lower Arkansas! 😉 ) “ya’ll” is a major part of my vocabulary. Hey, I don’t have a dog in this fight (ha), but Erik did you know that when you added the ya’ll map on this thread that it made it the main picture for the teaser to this page on your home page. As much as I like the map, I’m not sure it’s the best image to represent what this page is really about. 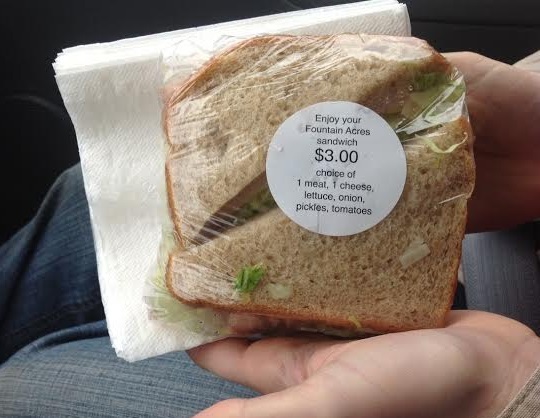 (ha) Just my $.02. Good point Don, it’s set up to display the most recently uploaded photo. Just tweaked it to show a more relevant one. How interesting, and thanks for the links to Katz’s maps! This really is of interest to me (like you)! I couldn’t spend much time browsing the maps, but did find that my family (moreso in Chgo. than the suburbs where I’ve lived) used the term “firefly” rather than the more common “lightning bug”. I always wondered about “in line” vs. “on line”—and was surprised to see that “in line” (which the VAST majority of people in my area use) is truly the predominant form, nation-wide. My family always used “soda” (in Chicago), but out in the suburbs most use “pop” (my adult kids still use “soda”). My family moved to Chicago from Poland about 110 years ago—which makes me wonder how immigration patterns factor into it all! Fascinating! Off to work, now! I’ll be passing around that link to friends and family, for sure! Rachel Weaver’s books are great. 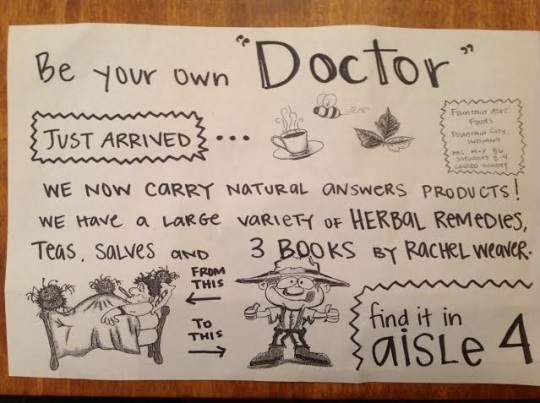 The sign for Be Your Own “Doctor” is pictured, but our favorite is Backyard Pharmacy. 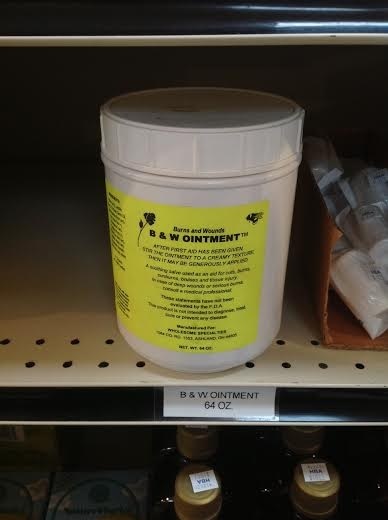 B and W ointment is a must-have for burns or any minor skin irritation as well. I have fair skin and put it on my face almost every evening on long sunny summer days (although we’ve forgotten what “summer” is here in VA.
I’ve done several bicycle rides in and through Wayne County the past few years, and must have missed every one of these church districts. 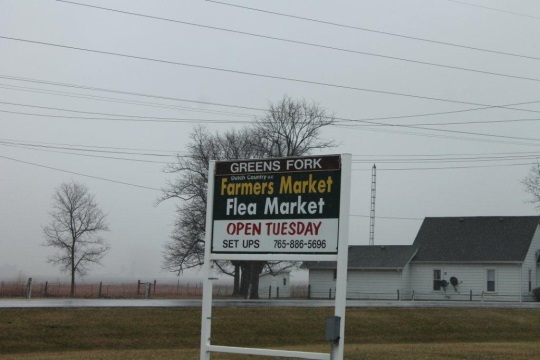 I’ve made a couple of passes through Greens Fork, but don’t think I have ever been in Fountain City. Last fall it was a matter of getting food in Fountain City or getting to the campground before dark, and I chose the latter. Do you think all of the settlements are in the Greens Fork to Fountain City part of the county? 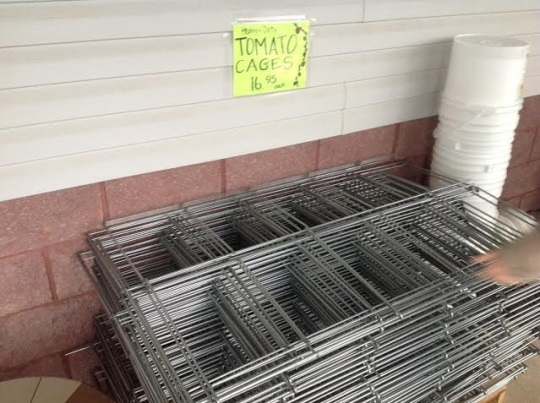 Tomatoes escaping out of cages; what an imagination! Thanks for the chuckle! 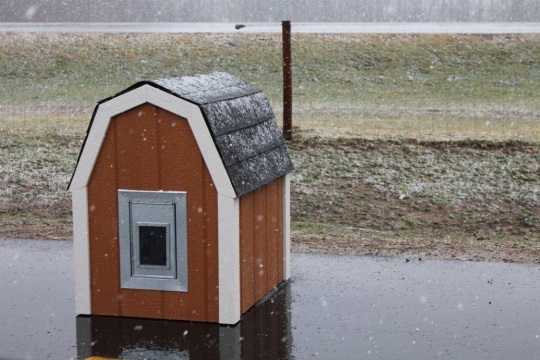 It looks like Fountain Acres Foods has many skylights to allow natural daylight to brighten the store, and the doghouse has a light coating of snow. “Violators could be towed” is more honest and realistic, so I appreciate that. It’s also more pacifist and turn-the-other-cheek-ish, so the Amish should appreciate that. The final infographic map is incomplete, however. It has no option for saying “all of you” or “alls y’alls,” both of which I’ve heard. Thank you Erik for making available these photos. If you read more about the study at the link, I think there’s something about not all options being provided–just the dominant responses (otherwise add “you’uns”, “youse”, “yinz” etc to the list…). Thanks for these good photos. That is the most incredibly tidy store I have ever seen! Not even any footprints on the floor in that weather! And the language map – is it connected to that “quiz” that’s been making the internet rounds? It’s spectacularly good, spot on for me and for everyone I know who took it. I took it too Adair (fun quiz! )–and it nailed my accent pretty close as well (I can’t remember exactly, but the three closest cities it matched me with were all slightly to the north of my hometown of Raleigh NC–Baltimore among them I believe). I’m guessing when you live in a place where “Y’all” is prominent, in daily use, you don’t hear it as much, because you get so used to it. People say “eh” a lot in my neighbourhood and it only stands out on odd ocasions, like, at least to me, when someone with a highly international accent uses it, and does it sarcastically toward us born and raised Canadians, at least that has been my experience, but, people do use “y’all” around here too sometimes, words migrate and get incorporated because of popular culture and multiculturalism. Beautiful pictures and great comments from the contributor and Erik, y’all have a great day, eh. Erik, thanks so much for answering my questions, I have learned more from you than my Amish Q & A group on Facebook ! Not bad for an English boy ! haha ! 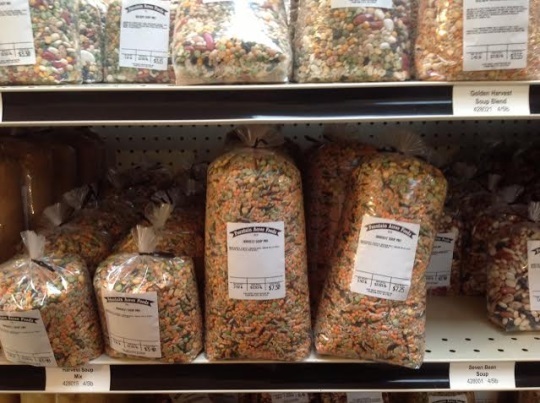 Those soup mixes sure look a lot like the ones at the Amish Market in Annapolis, MD. We had a terrible time last time we were there not buying one of everything! For the record, the plural of “Y’all” is “All Y’all”!! 🙂 and it’s very popular in Michigan to use both! It is a a nice clean store, the only problem I have going in there is that the people talk to each other in a different language even though they are all american. The people are nice but English should be spoke. When I have been talking with other people and the conversation comes up about the store everyone likes the store but most people do not like the other language being spoke in front of them.